Our President proved so many times that he is a compassionate man. And while Washington elites and media bashed him over McCain funeral, Trump’s actions so far only proved he has a big heart. In a statement issued Aug. 27, Trump said he had acted in response to the late senators’ survivors. “At the request of the McCain family, I have also authorized military transportation of Senator McCain’s remains from Arizona to Washington, D.C., military pallbearers and band support, and a horse and caisson transport during the service at the United States Naval Academy,” Trump said in the statement. Even though McCain funeral turned out to be a place for political bashing, our President showed he is bigger than that. Trump ordered all White House flags to be flown at half-staff Saturday night to honor Sen. John McCain (R-AZ) following news of his death. He expressed his condolences, he allowed Military transport for McCain to DC and military standing guard while in the capitol. He also respected McCain wishes to not attend his funeral. In an interview with Bloomberg, he said he’d accommodated the McCains as much as he could. “I’ve done everything that they requested,” he said. 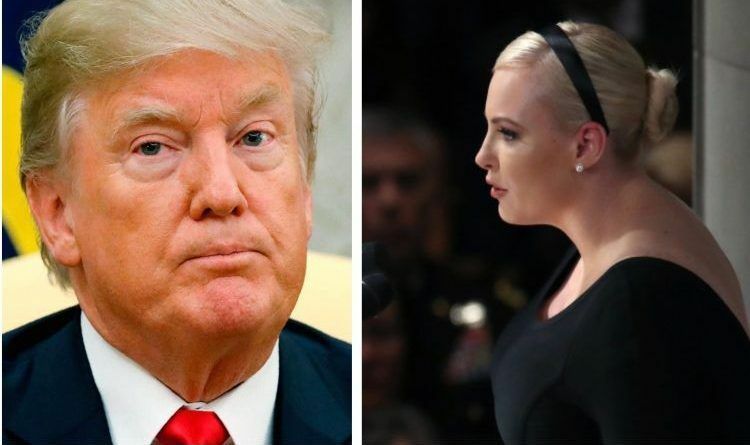 Unfortunately, this meant nothing to senator’s daughter Meghan McCain. It doesn’t matter how much he did for them. John McCain’s daughter went before national TV cameras and politicized his funeral. Trump had been nothing but gracious to her family all week. Our President actually kept his mouth shut for a week. I was disappointed she didn’t do the same. Throughout this entire John McCain adulation process, President Trump has shown himself the better person. McCain’s family has consistently shown their classless asses.